Steve Jobs who passed away in 2011 is being missed by so many people for his being always innovative and creating the new world. “Zen” have connected this man who attracts people with bold ideas, and Japan. Jobs encountered Zen in Zen Center in California. It is said that he tried to enter the priesthood in Japanese temple and people around him persuaded him out. At the bottom of his philosophy and aesthetics, we can see not only various ideologies and management strategy but also Zen spirit. Here, we look into Zen that have been affecting not only Japanese but also worldly famous people all over the world. Zen is a school of Mahayana and is also called Zen sect. It is said that Bodhidharma, a Buddhist monk from south India, started it after coming to China. 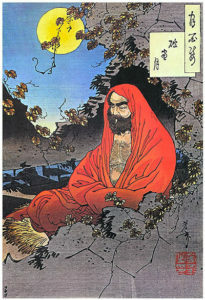 Bodhidharma is said to have continued Zazen (Zen sitting meditation) for 9 years, his hands and legs rotted and fell off. Japanese representative traditional craft “Daruma doll” was born from this story. Rinzai school was transmitted to Japan by Eisai during Kamakura period and Soutou school by Dogen during the same period. 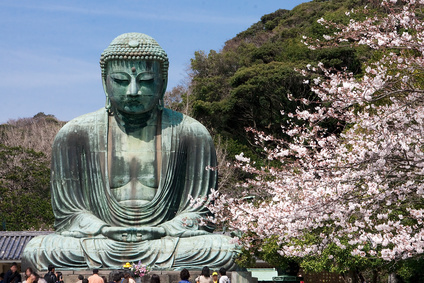 Zen became very popular in Japan from Kamakura period to Muromachi period and its influence are in various Japanese culture continuing till today. In Japan, traditional culture with “do” in its name are often influenced by Zen such as Kendo, Jyudo, Kyudo, Sado and Shodo. The definition of Zen is not clear and there is said to be tens of different definitions. However, when we see things with “do” in its name, we can find the common part that those all aim to calm own heart, improve oneself modestly and try to reach higher. The same goes with Sekitei and Karesansui garden which was popular during Muromachi period who includes trainings of mental concentration and aiming higher place. In famous garden of Ryoanji, there are 15 stones in which one of them are always on the back of the other. This comes from the number 15 being the perfect number in orient and that one stone that can’t be seen means “try to see what you don’t have yet and appreciate who you are today”. In art too, ink-wash painting was transmitted to Japan from China and was spread through monks of Zen resulting to famous ink-wash painter such as Sesshu. Cha which was brought to Japan by Eisai and was drunk as medicine mainly in temples but as it spread, it became a hobby. From there, the style of “Wabicha” which includes the ideology of Zen who aims the life separated from worldly world was born. Senno Rikyu who was the Head Tea Master of Nobunaga Oda and Hideyoshi Toyotomi completed Chanoyu which includes Tea room, tools and manners during Azuchi-Momoyama period and it had largely influenced Japanese tea culture. In the training of Zen, there is “Zazen” which is to sit and concentrate mentally. By doing “Zazen”, you can calm your body/respiration/heart and realize your own-self inside you. Zazen, that reinforces concentration and calmness regardless of what we face, is also used in company training and since it has some refreshing effect, it is very popular.